Enjoy a classy yet traditional look in your home by upgrading to hardwood flooring. 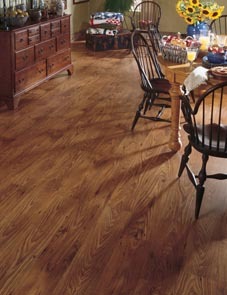 In Linton, IN, our Flooring America store carries a wide variety of hardwood floors in all colors, species, and styles. With all of the options we carry at our flooring warehouse showroom, you’ll effectively and dramatically transform your interior space. Our knowledgeable and friendly staff can help you find the perfect match for your home or business décor. We proudly carry engineered and solid hardwood flooring products from the most respected brands and trusted manufacturers in the industry. Even though we are a local store, we are also a part of the nationwide chain of stores. That means we are able to deliver personalized services, excellent prices, and top-quality products. Don’t let cost stand in the way of your new floor. Not only do we offer excellent hardwood flooring prices, but we feature special discounts for our customers. For instance, you can save as much as $500 on your new floor when you choose us as your flooring provider. We carry only first-rate products at reasonable prices. Why Install Solid Hardwood Flooring? Leave hardwood flooring installation to us. We’ll handle everything from delivery and floor prep to installation and cleanup. Our goal is to make the process easy and convenient for you. Most importantly, we want to ensure the finished project exceeds your satisfaction and lasts a long time. After all, a properly installed floor is a long-lasting floor. Since your satisfaction is our top priority, we provide an Ultimate Confidence Guarantee with our products and services. This is something you will not find at other flooring stores. If you ever encounter an installation-related problem with your floor, we will fix it at our expense. This promise applies to your floor for life! In addition, if for some reason you are not satisfied with your four-star or five-star floor within 30 days of installation, our team will replace it with a similar hardwood floor free of charge. Visit our store today for more information about our quality products. Contact us to learn more about our excellent selection of hardwood flooring. We proudly serve customers from Linton, IN, and the surrounding areas.